At Quintet we have extensive experience in integrating FusionCharts to web applications. The developers are experts in a wide range of server side scripting languages and will help to integrate FusionCharts into your web applications. At Quintet we will also ensure to choose the best data visualisation charts available according to the data that has to be displayed for you. We will provide better user experience by integrating websites with 100+ events provided by the FusionCharts library and will make sure that it works across all client platforms by taking advantage of FusionCharts platform compatibility. We have completed projects for those clients who had chosen to visualize data for improving user experience. Visualizing data provides huge advantages for users since it is easy to grasp. It hold more options and features than HighCharts or Google Charts. It provides more data types matching your data. Quintet helps you to modify data structure to properly integrate it with FusionCharts. Why do you need Fusioncharts? 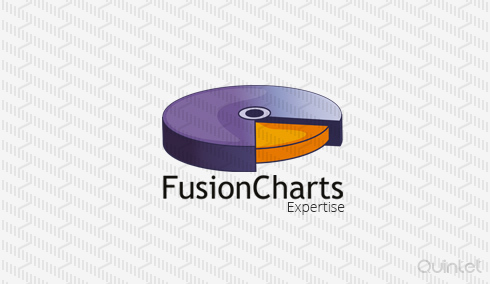 Fusioncharts Suite XT has amazing looking charts , Some of the best in the industry. It has beautiful animations , latest designs and rich in interaction. If you have this integrated in your system you can show off your beautiful dashboard in your products which will increase your sales and also people will adopt the product application of your company. FusionCharts Suite XT offers a unified experience across Desktops, Macs, iPhones, iPads, or Android devices. It works with all your web and mobile applications, including IE 6, 7 and 8 which is really great. Because of wide range of templates it only takes 15 minutes to create your first chart. it has high tech reporting capabilities like unlimited drill-down, chart export and interactive legends that are inbuilt, it just takes a matter of time for our programmers to integrate it. Sometimes companies make do with simple charts because the component they are using can’t support advanced charts. But incorrect chart types will lead incorrect analysis and interpretation , which in turn will hit the business if they rely on these wrong charts. FusionCharts Suite XT gives you 90+ charts and graphs ranging from basic ones the advanced Funnel, Heat Map, Zoom Line and Multi-Axis Charts.